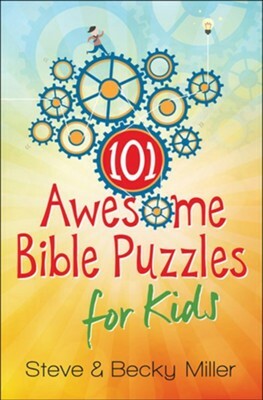 Now kids can learn about the Bible while they play with 101 Awesome Bible Puzzles for Kids. Recommended for ages 8 to 12 years, this book is filled with a collection of Bible puzzles that are safe and entertaining for way for kids to practice their detective skills. Includes mazes, word searches, hidden words, riddles and more. 101 Awesome Bible Puzzles for Kids promises hours of fun on trips, at home, on church activity nights, at family gatheringsany place that's just waiting for a fun-filled adventure. Plus your kids will get to know their Bible better along the way. But watch outonce they get started, they'll have so much fun they won't want to stop! Steve and Becky Miller created the popular Take Me Through the Bible series, which includes Word Searches for Kids, Memory Verse Games for Kids, and Amazing Mazes for Kids. They reside in Oregons Willamette Valley with their three sons. I'm the author/artist and I want to review 101 Awesome Bible Puzzles for Kids.